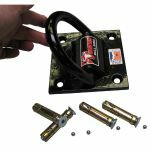 Do you need a bolt down security ground anchor to lock your motorcycle, or other high value equipment to? If so, you`ll want one that you can rely on! 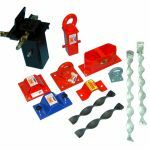 The robust hardened steel units shown here are surface mount (bolt down) ground anchors, however we also offer a range of tried and tested alternative types including;"concrete-in" ground anchors (sometimes called embedded ground anchors), wall anchor points and the innovative spirolock ground anchors. Why choose a bolt down surface mount ground anchor? Providing you`ve already got a robust concrete base or similar to fix to, using a bolt down ground anchor avoids the need to dig a hole and fill it with concrete ...and wait for it to set. You simply need to drill fixing holes into the existing concrete base at appropriate positions and bolt the ground anchor to it with the special security bolts provided - job done, you`ve got a motorcycle anchor point ready for immediate use. Manufactured from welded heavy gauge (up to 12mm) steel plate, this unit is finished in a robust powder coat paint and is designed to bolt into any solid surface such as concrete, brick, etc. In operation the security chain passes through the special double shackle thus forming the anchor point, and the chain can then be wrapped around the item to be secured and the end links padlocked together or to the secured item. 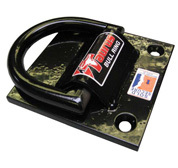 Manufactured from pressed heavy gauge steel plate, this unit is finished in a robust powder coat paint and is designed to bolt into any solid surface such as concrete, brick, etc. In operation the security chain passes through the bridge section thus forming the anchor point, and the chain can then be wrapped around the item to be secured and the end links padlocked together or to the secured item.